Yesterday CNBC launched its new look. We like it. It’s cleaner and more modern looking. The graphics pop better. But what do the insiders at CNBC say? 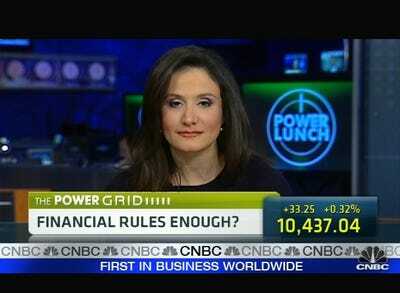 We got our spies at CNBC to track down Michelle Caruso-Cabrera for a comment. “Love the redesign! When I am anchoring on the set, it is much easier to read the “bug-bar” at the top. (Yes, that’s what we call it.) CNBC, more than any other network, has long understood the importance of maximizing the use of screen real estate,” said Michelle. Of course, she probably has to say that.